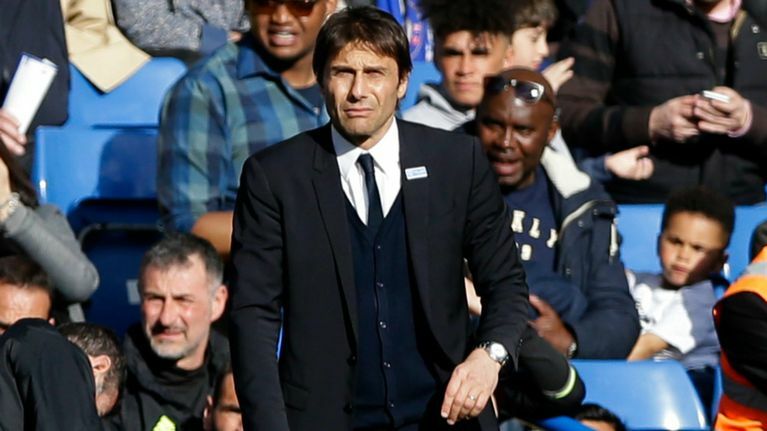 Chelsea manager Antonio Conte conceded that the Premier League title race became “more interesting” following his side’s stunning 2-1 loss vs. Crystal Palace. The Blues entered the match with a 10-point cushion on their nearest rivals, but a spirited Palace performance saw that lead slip. An early goal from Chelsea indicated the title-favorites would retain their advantage until the Eagles turned the tables. Some haphazard Chelsea defending opened the door for the opportunistic Palace to seize a 2-1 lead. They wouldn’t relinquish their lead despite the Blues peppering shots at their goal and the Blues saw their 13-match home winning streak improbably snapped. With Spurs toppling Burnley, Chelsea’s buffer at the top of the table now sits at 7 points. While disheartened his side couldn’t rescue at least a point, Conte acknowledged the turn of events spices up the title race. It’s true, easy games don’t exist, but Chelsea will rue their performance against a side that was in the relegation zone at the end of February. The bad news for Chelsea is that much more difficult competition looms midweek as Manchester City visit Stamford Bridge on Wednesday. If the Blues fall at home again, then the chase will really get interesting. Antonio Conte said the Premier League title race had got interesting again after his Chelsea side were beaten 2-1 by Crystal Palace. Chelsea's 13-game winning run at home came to a shuddering halt as Wilfried Zaha and Christian Benteke scored in quick succession after Cesc Fabregas had opened the scoring. Chelsea are now seven points clear of second-placed Tottenham with nine games to play, beginning with Wednesday's clash with rivals Manchester City. They still need 21 points to be mathematically certain of winning the title. "For sure, for you [the media] it's a good result, because [it] makes this more interesting in the championship," Conte said. "But I always said the league finishes when you have the mathematical [certainty] that you won. "Otherwise you must fight, you must play every game to try to win. "In England it doesn't exist, an easy game. Every game will be very tough, from now until the end, if the team name is Manchester City or a team that is fighting for the relegation zone." Chelsea were beaten for just the second time in 18 home games under Conte and conceded twice for the first time since the Jan. 4 loss at Tottenham, despite having Eden Hazard back following a calf injury. There was an element of good fortune for Palace, with Andros Townsend lucky not to concede a penalty when Pedro's shot struck his arm after 17 minutes. Conte added: "It's very difficult to see this situation. For sure there was something, but I think it's right also to accept the decision of the referee. "We hope in the future to be better, the decisions. It's a pity, but I think today it wasn't our day. We deserved at least to draw. I don't want to say to win, but at least a draw. "We created many chances to score. We dominated the game." Palace boss Sam Allardyce opened his postmatch news conference by saying: "That shocked you all, didn't it?" Allardyce -- who also challenged Zaha to aspire to the level of Hazard -- added: "It's an absolutely outstanding victory for us, particularly in the position we're in. Nobody expected it." 0 Response to "Is there a Premier League title race? Antonio Conte says it’s ‘more interesting’ following Chelsea loss"